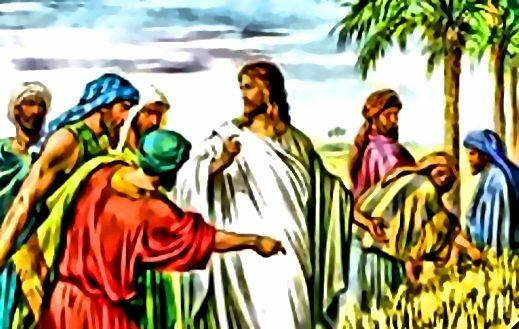 There have been numerous attempts by misguided people to say that there is no ministerial priesthood in the entire New Testament, proudly saying "There is no word "priest" in the New Testament, so therefore that Old Testament concept of a priest offering sacrifice for the sins of the people is gone. Jesus is the one high priest forever, and his sacrifice on the cross 2000 years ago, once and for all, is all that we need." But is that true? Did people in the Old Testament need priests to offer sacrifice for them, but we living in the New Testament do not? This page will examine some of the facts which may not be evident to the casual bible reader. 1 Timothy 4:14: Do not neglect the gift you have, which was given you by prophetic utterance when the council of elders laid their hands upon you. James 5:14-15: Is any among you sick? Let him call for the elders of the church, and let them pray over him, anointing him with oil in the name of the Lord; and the prayer of faith will save the sick man, and the Lord will raise him up; and if he has committed sins, he will be forgiven. Another word in the New Testament that Paul mentions is the word "reconciliation." 2 Corinthians 5;18-19: All this is from God, who through Christ reconciled us to himself and gave us the ministry of reconciliation; that is, in Christ God was reconciling the world to himself, not counting their trespasses against them, and entrusting to us the message of reconciliation. John 20:21-23: Jesus said to them again, "Peace be with you. As the Father has sent me, even so I send you." And when he had said this, he breathed on them, and said to them, "Receive the Holy Spirit. If you forgive the sins of any, they are forgiven; if you retain the sins of any, they are retained. Matthew 3:6: and they were baptized by him in the river Jordan, confessing their sins. Mark 1:5: And there went out to him all the country of Judea, and all the people of Jerusalem; and they were baptized by him in the river Jordan, confessing their sins. Acts.19:18: Many also of those who were now believers came, confessing and divulging their practices. 1 Timothy 6:12: Fight the good fight of the faith; take hold of the eternal life to which you were called when you made the good confession in the presence of many witnesses. But what about the concept of priests offering sacrifice for the sins of the people, like the Old Testament priests did? Where is THAT in the New Testament? Well, we need look no farther than that famous event in the Gospels called "The Last Supper," more appropriately named "The First Eucharist." The Jewish Passover meal is to be celebrated forever, according to Exodus 12:24. The Passover LITURGY, or Rite, saved the firstborn children of the Israelites from death. This liturgy consisted of slaughtering an unblemished lamb, putting its blood over their door outside, and eating the lamb with unleavened bread and bitter herbs. Jesus Christ celebrated this Passover liturgy right before He died, changing forever its meaning. NOW, Jesus is the sacrificed spotless lamb that is to be sacrificed and consumed in the form of unleavened bread, now known as the Communion Host. NOW we are saved from the death of sin, rather than from physical death like our ancestors the Israelites in Egypt. He told His apostles to "Do THIS in His remembrance," thus ordaining them forever as his priests. So many people miss the word "THIS" and mistakenly translate the word "remembrance" into the word "symbolic." The word "THIS" means "THIS is my body which IS given for you, and "THIS cup which is poured out for you IS the new covenant in my blood." We know from the Passover celebration of the Jews that each generation sees itself as participating in the original passover celebration and exodus from Egypt. Just so, through time and space (God is not bound by these human constraints), we celebrate with Christ in the original Last Supper, where He is both Priest AND Victim. Just like the Israelites had to actually eat the real spotless lamb to be saved from physical death, we today have to actually eat the real spotless lamb, Jesus, to be saved from spiritual death. Just as the Israelites had to actually use the real blood of the lamb to be saved from physical death, we today have to drink the real blood of the spotless lamb, Jesus, to be saved from spiritual death. Symbolic food like a plastic banana does NOT have the nutritional value to nourish our bodies like a real banana does. Just so, symbolic bread does not have the spiritual power to save us from death like the real body of Christ does (see John 6:48-58). There are other New Testament passages which indicate that the apostles were the first priests. 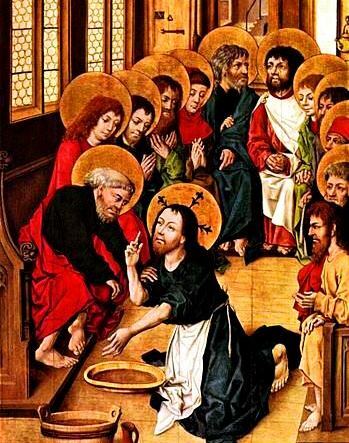 The washing of the feet of the apostles in John 13:5 recalls the Old Testament dictate that priests had to wash their feet as well, in Exodus 30:19; Jesus reminding the Pharisees that his apostles could pluck grain and eat it on the Sabbath, while telling the story of David and his priests eating the Bread of the Presence (why tell this story if Jesus is not comparing David's priests to his apostles, who are also exempt from the strict dictates of the law?) in Matthew 12, are other references to the New Testament Priesthood. There is also another type of priesthood in the New Testament, besides the aforementioned ministerial priesthood. And that is the priesthood of the baptized. That's right, each one of us who are baptized are priests! But not ministerial priests. Rather, the sacrifice we offer to God daily is OURSELVES! Our daily sacrifices we make for our family and friends is what we offer to God, and it is united to the sacrificial priesthood of the priests and to the eternal high priesthood of Jesus Christ at each and every Mass! Romans 6:3-6: Do you not know that all of us who have been baptized into Christ Jesus were baptized into his death? We were buried therefore with him by baptism into death, so that as Christ was raised from the dead by the glory of the Father, we too might walk in newness of life. For if we have been united with him in a death like his, we shall certainly be united with him in a resurrection like his. We know that our old self was crucified with him so that the sinful body might be destroyed, and we might no longer be enslaved to sin. 1 Peter 2:4-9: Come to him, to that living stone, rejected by men but in God's sight chosen and precious; and like living stones be yourselves built into a spiritual house, to be a holy priesthood, to offer spiritual sacrifices acceptable to God through Jesus Christ. For it stands in scripture: "Behold, I am laying in Zion a stone, a cornerstone chosen and precious, and he who believes in him will not be put to shame." To you therefore who believe, he is precious, but for those who do not believe, "The very stone which the builders rejected has become the head of the corner," and "A stone that will make men stumble, a rock that will make them fall"; for they stumble because they disobey the word, as they were destined to do. But you are a chosen race, a royal priesthood, a holy nation, God's own people, that you may declare the wonderful deeds of him who called you out of darkness into his marvelous light. The priesthood of the laity, or baptized, is a complementary priesthood to the ministerial priesthood. The priesthood of the laity is like the body of Christ, whereas the ministerial priesthood is like the head of Christ. In the Mass, the body of Christ is united with its head, Jesus Christ, in the Holy Sacrifice of the Mass. Pray, brethren (brothers and sisters), that my sacrifice and yours may be acceptable to God, the almighty Father. The Second Vatican Council in its Dogmatic Constitution on the Church Lumen gentium 10 defined that the priesthood given in baptism is a true participation in the priesthood of Christ, but that it differs qualitatively from the ministerial priesthood conferred by the sacrament of Holy Orders. The ordained don’t merely receive more priesthood. They receive a priesthood different from that which they already had from baptism. These two modes of priesthood, distinct but sharing a common source, relate to each other as a single person’s head does with the body. In the Council’s the Decree on the Ministry and Life of Priests we read that, by Holy Orders, priests are configured in their being to Christ the Priest so that they are able to act in the person of Christ who is the Head of the Body, the Church (cf. Presbyterorum ordinis 2). Priests are ordained for their own sake (to help them save their own souls by doing God’s will) and for all the faithful (who must be directed to God through teaching, governance and sanctification). Priests offer gifts and sacrifice to God for the people (cf. Hebrews 5). Lay people, with the priesthood of the baptized, are the vanguard of the Church’s mission in the world. Priests, set apart by ordination, concern themselves mainly with that which is sacred. Lay people are primarily concerned with the secular. Priests form and inform, nourish and strengthen, heal and guide lay people for their indispensable work. Lay people do what no priest can: through deeds and words they bring Christ to every sphere of daily life in the world. The complementary – not competing – roles and states of life of the ordained and of the laity must be respected. This is especially important in our liturgical worship. At the Offertory the priest says “my sacrifice and yours”. He acts and speaks in the person of Christ, the Head of the Body, the Church. He calls the people, Body of the Church, into complementary unity. He invites them to pray that his sacrifice, according to his manner of offering sacrifice as an ordained priest, and their (“your”) sacrifice, according to how the baptized offer gifts and sacrifices, will be accepted. What the priest does is done is for service. A priest is not less in need of a Savior than anyone else present. St. Augustine of Hippo (d 430), speaking of his role as bishop, described his relationship with his flock in the best way when he said, “I am a bishop for you, but a Christian with you” (s. 46.2). Were ten thousand baptized men, women and children to pronounce the words of consecration over their bread and wine, the offerings would remain bread and wine. One priest, alone or with a congregation, by God’s power changes the people’s bread and wine into the Body and Blood of Christ. The baptized unite their way of offering sacrifice to his way. “My sacrifice and yours” is an important and long-needed improvement. Here is something I can recommend for your deeper active participation in this invitation by the priest. It can help to identify ourselves with the gifts placed on the altar for consecration. The congregation is invited by the priest to unite their sacrifices to those he offers in his manner of offering. We all have both burdens and reasons to rejoice. Therefore, when the priest or deacon is preparing the chalice, when he puts drops of water (the symbol of the human) into the wine (the symbol of the divine) to be mingled – the lesser being transformed within the greater – try consciously to place into that chalice all your cares, aspirations, sentiments of gratitude, petitions, and all that you are. Let it all be joined, before they are stupendously transformed by God. This may make the invitation and then the response ring with something new each time you hear it and respond in turn. Pray, brethren, that my sacrifice and yours may be acceptable to God, the almighty Father.